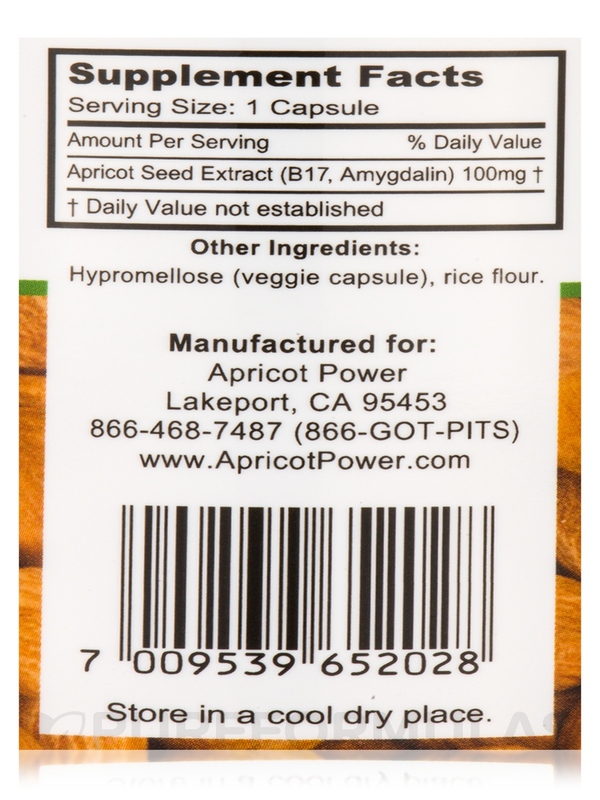 I have dealt with Apricot Power for several years and they are a really good company. The fact that I get no side effects from B17 (Amygdalin) 100 mg by Apricot Power and the size of the capsule. Apricot seeds are powerful. I'm so glad I found these B17 by Apricot Power Capsules here... I'll definitely be coming back for more! B17 is a substance found naturally in over 1200 different foods‚ including the seeds of many kinds of fruits‚ such as apricots‚ plums‚ cherries‚ oranges‚ nectarines‚ apples and peaches‚ as well as many raw nuts. 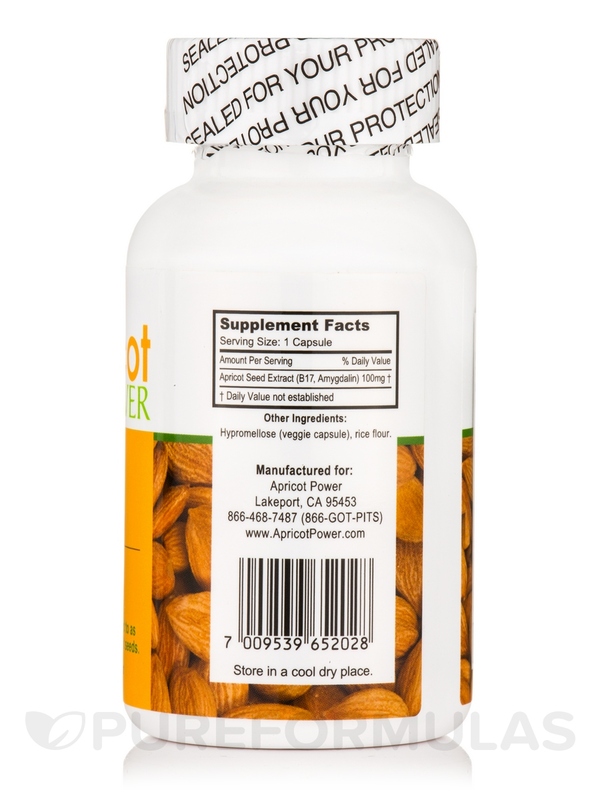 Apricot Power's natural B17 supplement is extracted from apricot kernels. B17 was the name given to the purified form of the molecule by a biochemist named Ernst T Krebs in 1952. It is a non-toxic natural product found in over 1‚200 foods. Today B17 is extracted from apricot seeds/kernels. Apricot Power believe that a balanced diet is essential to a healthy life. Few of us consume enough vitamins and minerals from the foods we eat. Nutritional supplements become necessary for optimal body function. B17 is just one of the many nutrients our body needs. In addition to apricot seeds‚ B17 is found in wild blackberries‚ wild crabapples‚ elderberries‚ apple seeds‚ cherry seeds‚ nectarine seeds‚ peach seeds‚ pear seeds‚ plum seeds‚ prune seeds‚ fava‚ bamboo‚ alfalfa‚ eucalyptus and cassava. Other foods that contain lesser amounts of B17 are boysenberries‚ huckleberries‚ raspberries‚ strawberries‚ squash seeds‚ black beans‚ black eyed peas‚ lentils‚ lima beans‚ kidney beans‚ garbanzo beans‚ cashews‚ macadamia nuts‚ spinach‚ watercress‚ sweet potatoes and yams. 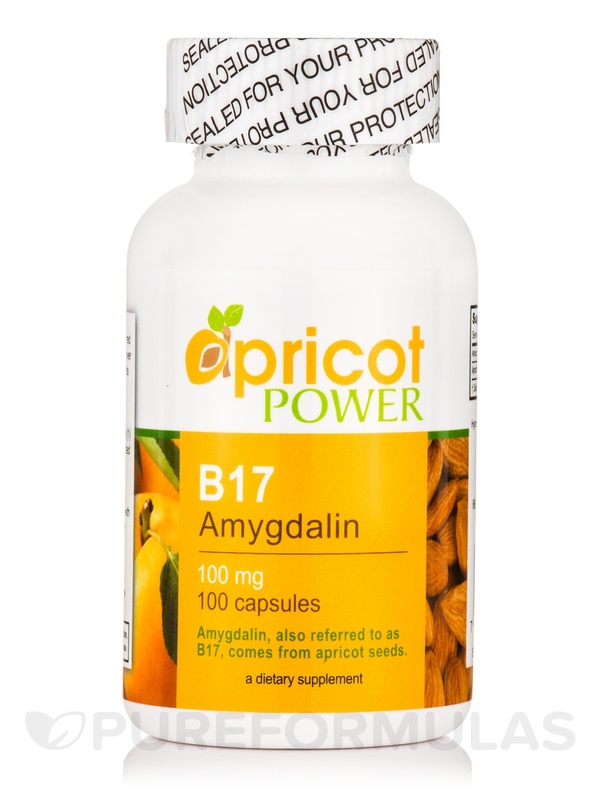 B17 (Amygdalin) 100 mg by Apricot Power is the real deal. I have been taking this for a while now and I know it has been working because my melanomas have not returned and my skin looks wonderful!! Thank you!! I like the availability and quality of the product. It could stand to be a bit more inexpensive. 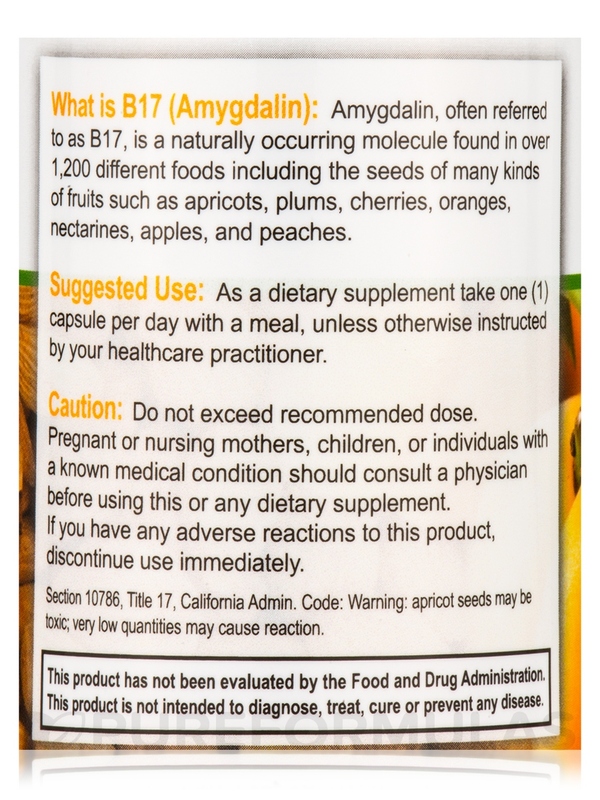 I bought B17 Amygdalin by Apricot Power for friend with an illness, was getting sick & diarrhea so had her back off on it. My husband couldn't take B17 at all but most do with no problems. 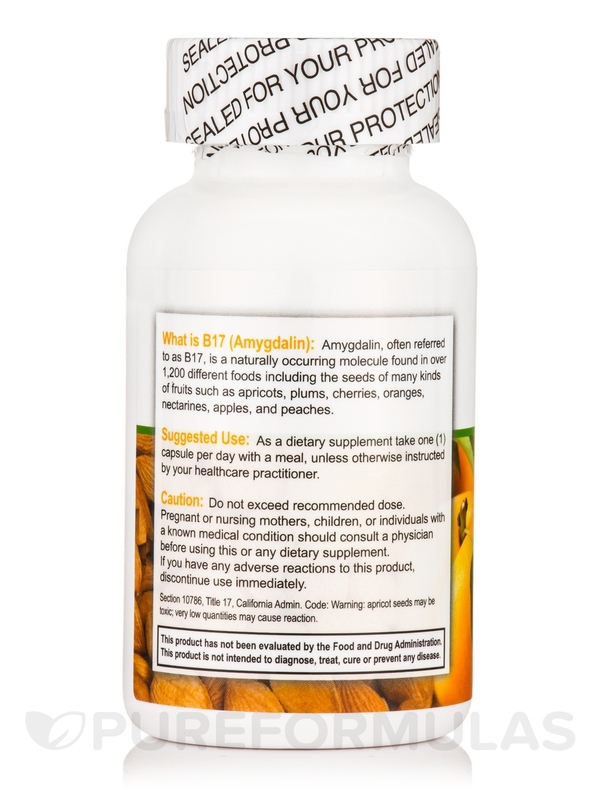 B17 Amygdalin by Apricot Power is easy to swallow. No bitter taste. I like the dosage and size. We have been taking Vitamin B-17 for about 40 some years. B-17 is natural and everyone should be taking it. We get both in capsules and also the Apricot pits. How long after taking B17 apricot power will someone see results? Is their a time frame recommended for taking this product? Hi Ann, we do apologize but we will not be able to know exactly when you will be able to see results. Everyone breaks down and reacts to products differently and can experience results differently. How many mg. of B-17 are in each of the 100mg capsules compared to the 500mg capsule?